At Green College, you have your say about what can happen. Committees are a central part of residence life at the College. Each committee has a unique vision for enriching UBC students' academic and extracurricular experiences. Green College has several types of committees: Standing, Resident, and Special Purpose. The Standing Committees are the primary decision-making bodies for the College. They are advisory to the Principal and are normally chaired by the Principal. There are four places on each committee for Resident Members, who are chosen by ballot. The other four places are filled by Faculty Members of the College at the invitation of the Principal. A resident may serve on no more than one committee in a given academic year. After serving on a particular committee, a resident will not normally be eligible to serve on the same committee again. This way the College can benefit from a wide range of resident experience. The Academic Committee is responsible for the College's interdisciplinary academic programming, including the appointments of the Cecil H. and Ida Green Visiting Professors. The College's Program and Communications Manager and Event Coordinator attend committee meetings. The committee meets about twice a term. The Membership Committee is responsible for evaluating applications for resident membership and for selecting Resident Members of the College. The College's Administration Manager and Membership and Accommodations Clerk attend committee meetings. The committee meets monthly, with the main business of the year falling between March and July. Members of this committee should be planning to stay in residence during the spring and summer, or at least be willing to review files by e-mail while away. The Media and Communications Committee helps to plan and coordinate both external publicity and publication initiatives and internal communication channels for the College. The College's Communications Manager attends committee meetings. The Arts Committee provides a variety of ways for people to experience and appreciate arts at the College, such as talks, musical performances, creative activities for residents and Society Members, and exhibits. The Committee has a growing history of producing "Coffee House" events at the College to showcase member talent. The Sustainability Committee increases environmental awareness of Green College residents and leads initiatives for residents to decrease their environmental impact. The Committee continues to build partnerships with other environmental organizations on campus and aspires to become a more prominent advocate for a low-impact university community. This committee also shares and coordinates community garden space on grounds with the Green College Dining Society. The Outreach Committee is dedicated to helping the local and global community by arranging volunteer opportunities, raising awareness of social concerns, and initiating fundraising events. The Committee is responsible for clearing and donating items that accumulate in the common Laundry area. The Reading Room Committee acquires and catalogues reading materials for the Reading Room in Graham House, and is responsible for keeping the collection in order. Each year, the committee surveys residents to determine which publications to subscribe to. The Social Committee organizes social events at the College, such as pub nights and seasonal parties. The Committee is also responsible for the programming of major annual social events, including the Welcome Dinner, Winter Gala, and Spring Gala. Under the Social Committee, smaller groups have formed such as College Vert (promoting French-themed dinners and films, and conversational French) and the Welcome Committee (tasked with organizing "welcome" events for September). The Inter-Collegiate Affairs Committee was formed in 2014 to foster friendship between Green College and St. John's College, the international graduate college at UBC. The Committee introduced the bi-annual St. John's-Green College competition, where both colleges duke it out over a series of athletic and artistic events for the coveted Wreck-Tower Cup trophy. Of course, the night always ends in dance! Other cross-college bonding events include a meal-swap night where St. John's residents can dine at Green and vice versa. A subcommittee of the Social Committee, the College Vert Committee is a task-force of resident volunteers who help coordinate and execute French-themed dinners and films, and conversational French. The Sports Committee strives to provide members of the College with a variety of sporting opportunities, both recreational and organized, for individuals and teams. 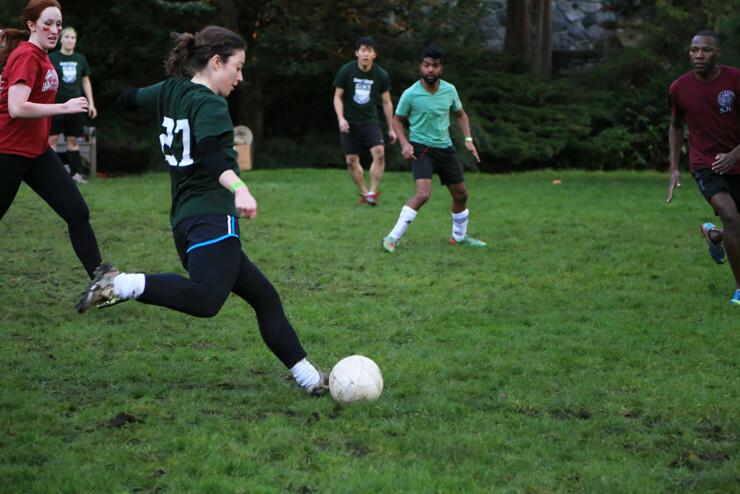 In addition to planning sports events at the College such as Soccer Sundays, the Committee promotes participation in external competitions such as UBC's Legacy Games and the Vancouver Sun Run. It also provides an extensive collection of sporting equipment and games for College members to borrow, including a pair of nets that can be used for both soccer and hockey. 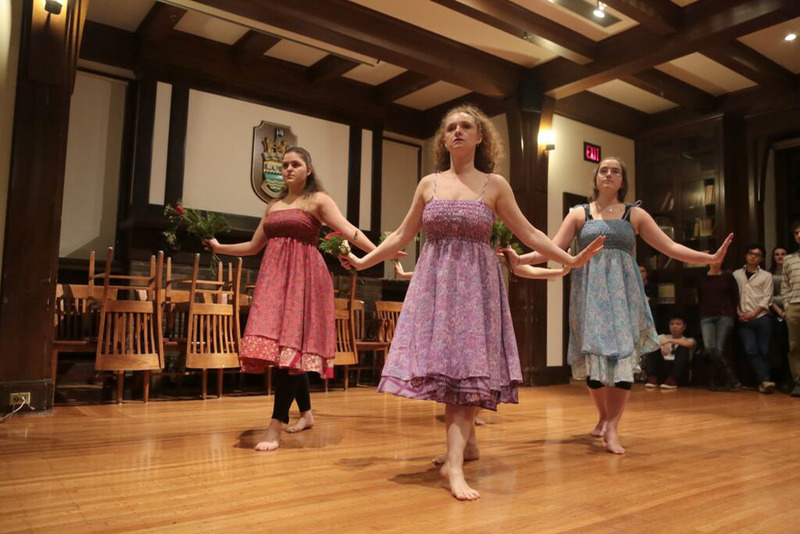 The Green College Players is the College's theatrical company that mounts one show each year. The show is acted, directed, produced and designed by members of Green College, and well attended by the wider UBC community. The Wellness Committee is dedicated to engaging Green College members about health and wellness. Through an integrated approach with other committees, College activities, and UBC support networks the committee develops fun activities and awareness campaigns to support the community. The Welcome Committee is a task-force of resident volunteers who help coordinate and execute the "Welcome" activities each summer for September. These activities include a variety of "icebreaker," community-learning, and fun events to introduce the College's community spirit. Over the year they answer prospective and incoming members' questions about life at the College from a resident perspective. The Health and Safety Committee's core duties each year are to update the fire and safety plans of the College, assign floor/fire wardens in each building, conduct the fire drill, and work on additional health and safety improvements as needed. This committee is chaired by the Administration Manager and made up primarily from resident volunteers. The Common Kitchen Committee is a group of resident volunteers who help coordinate the use of the Common Kitchen as a safe and hygienic shared space. They organize the inventory and chores to maintain the kitchen, while providing a venue for suggestions of improvements and concerns. The Committee consists of no more than 5 resident representatives, but may keep additional members as alternates.